Be the first to share your favorite memory, photo or story of Otis. This memorial page is dedicated for family, friends and future generations to celebrate the life of their loved one. 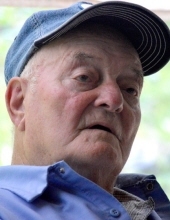 Otis Gibson, age 85, of Pinetop, Kentucky, passed away Tuesday, March 19, 2019 at the Hazard Appalachian Regional Medical Center. He was born at May, Kentucky on January 29, 1934 to Alex Gibson andMartha Niece. Funeral services for Otis Gibson will be held at the Hindman Funeral Services Chapel at Hindman, KY, 2 PM Friday, March 22, 2019 with Randall Short and Ted Collins officiating. Entombment will follow in the Bethel Memorial Mausoleum at Hindman, KY. Visitation will be held at the Hindman Funeral Services Chapel at Hindman, KY from 6-9 PM Thursday with additional services 7 PM. Hindman Funeral Services in charge of arrangements. "Email Address" would like to share the life celebration of Otis Gibson. Click on the "link" to go to share a favorite memory or leave a condolence message for the family.